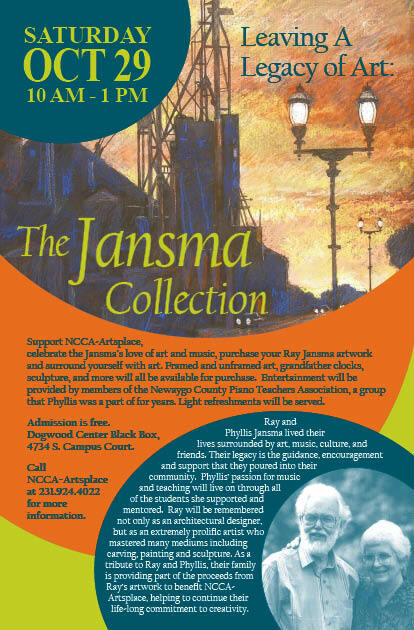 Join us on Saturday, October 29 for a unique opportunity to celebrate Ray and Phyllis Jansma, view and purchase artwork of Ray Jansma, and help support NCCA-Artsplace! Ray and Phyllis Jansma lived their lives surrounded by art, music, culture, and friends. Their legacy is the guidance, encouragement and support that they so willingly gave to their community. Phyllis’ passion for music and teaching will live on through all of the students she supported and mentored. Ray will be remembered not only as an architectural designer, but as an extremely prolific artist who mastered many mediums including carving, painting and sculpture. As a tribute to Ray and Phyllis, their family is providing part of the proceeds from Ray’s artwork to benefit NCCA-Artsplace, helping to continue their life-long commitment to creativity. Framed and unframed art, grandfather clocks, sculpture, a classical guitar, a carved “Angel” bed and more will all be available for purchase. Entertainment will be provided by members of the Newaygo County Piano Teachers Association, a group that Phyllis was a part of for years. Support NCCA-Artsplace, celebrate the Jansma’s love of art and music, purchase your Ray Jansma artwork and surround yourself with art on Saturday, October 29, 10:00 a.m. – 1:00 p.m. Light refreshments will be served. Admission is free. The event location is the Dogwood Center Black Box, 4734 S. Campus Court, one mile east of downtown Fremont. Call NCCA-Artsplace at 231.924.4022 for more information.